At this point both Chantal and Frank begin to defend their position and rattle off a series of “reasons” as to why things are the way they are. Weather delays, late deliveries, the flu, and the economy, are all blamed for the lackluster performance in both cases. I remember back when I was in door-to-door sales, barely out of my teens, sitting with small groups of salespeople huddled together in diners, continuing on the conversation that started at our mandatory morning sales meeting, about why sales are down. In these conversations you typically hear every excuse on earth except the one in which people take personal responsibility for the poor sales numbers. If you’ve ever seen the 1992 movie “Glengarry, Glen Ross,” with Jack Lemmon and a cast of other great actors, you may remember the scenes with all the salespeople blaming their lackluster performance on “the leads.” They go on and on about how, if the leads were better, they’d all be selling more. One of the keys to achieving higher levels of success is to give up blame all together. When you take personal responsibility for the conditions in your life you are then empowered to change them. Until you are willing to do this you remain a victim of circumstances. The types of meetings described above begin a steady stream of “reasons” (excuses) why things are not better. People begin looking for ways to place blame wherever they can and the entire conversation turns into a negative, finger-pointing exercise that produces little, if any, useful result. The meetings continue along in this manner, with each department head explaining why business is not better and trying to find someplace to assign blame until, sufficiently demoralized, the managers return to their respective departments vowing to do better, feeling defeated, and sometimes not caring whether or not they do better. While on the surface this seems quite normal, in practice it does little more than leave people feeling depressed and dejected. Yes, there is value in examining mistakes and learning from them, however, if you accept the centuries old idea that, “our minds move in the direction of our dominant thoughts,” as it was expressed by motivation legend Earl Nightingale, you will soon realize that these meetings cannot possibly result in anything but a negative outcome. You can beat a problem to death in endless meetings but it will not alter the fact that something is not working. Why would you want to invest any more time in talking about things that do not work? Yet, that’s exactly what’s taking place in meeting rooms and on shop floors in companies all across America everyday. With a steady barrage of negativity being dispersed at them, it’s no wonder that the level of employee engagement is at an all-time low. One the other side of the coin we have the employees themselves carrying this negative tone throughout the entire organization. These people are, according to Gallup, “The eighteen percent who are actively engaged in spreading ill-will throughout the company. Simply replacing the “What’s wrong” question, with “What’s working,” will cause your mind to search for things that are going right and, as a result of the law of attraction (like attracts like), you will begin finding more and more things that are working. In the case of discussing strategies and activities, starting with what’s working enables you to build further improvements on a solid foundation that is already producing the desirable results. By focusing brainstorming sessions around what’s working and drilling further into that is what makes achieving quantum results possible. In business meetings you can use this type of questioning to identify the actions and activities that are producing positive results and build upon that. You may be surprised to learn that some of what you’ve been doing does not work and, most likely, never will. Knowing this enables you to invest your time and resources in those activities that are working and stop wasting valuable assets on those that are not. A law firm following this procedure, for example, may learn that the pile of money they’ve been sinking into Yellow Page advertising is not paying for itself while their YouTube and social media activity is going gangbusters. Knowing this enables them to reallocate marketing resources where they will do the most good. If you consider the amount of time spent thinking, worrying and talking about what’s wrong you’ll soon realize it’s one of the most destructive things any organization can do. By changing your focus to what’s working, what’s going right, and what’s positive in a given situation, you’re in a better position to access your best and brightest ideas and take the actions that will produce the results you desire. All too often the only time people are recognized at their job is when they’re being criticized for not reaching a goal or making a mistake. Unproductive practices like this contribute greatly to the frustrations and unhappiness people experience at work. I’m not suggesting that you ignore missed revenue targets or allow sloppy work to continue but, when at all possible, focus on what is working and the value the person brings to then organization. We all need to be recognized for the contribution we’re making at work. Changing the tone of the conversation in the workplace in a more positive direction will go a long way toward increasing employee engagement and, as a result, increase productivity and happiness throughout your organization. 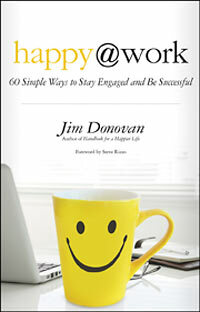 Jim Donovan speaks regularly to employees and executives at small business and large corporations. He is a frequent media guest and expert source on personal development, business success, and the spiritual laws that develop both. He lives in Bucks County, PA. His website is www.JimDonovan.com.